Fast rising Comedian Bethel Nkoju popularly known as Senator, wed his girlfriend of five years Kemen Jibrin on Saturday May 19h in Jos Plateau where the bride is from. The happy couple are planning their honeymoon for later this month in Gambia and London. Congrats to them. Is d new in-thing now a "white tux"?? Y wear white wif d bride? Linda u didn't put up patience Uzokwu's son's wedding!! Did M I wear a white body shirt??? Or am not seeing clearly. 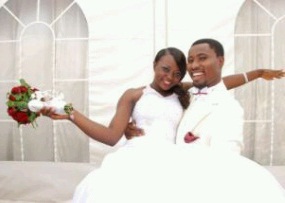 Hapi married life u two. congrats dear! By the way, what is princess doing with her hand? Why do Nigerians always jump on the 'bandwagon'? What's with this white Tux trend? There was Stephanie's husband, then Chidi Momeme, recently Osae Odemwingie and now, Senator! Arrrrrgh! Abel what happened to the classic Black or dapper Navy Blue? Abegggggi, e don do! Tsk Tsk! 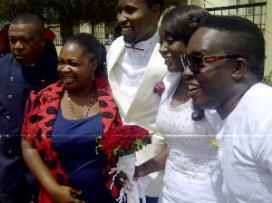 I can see M.I, Francis Duru and that Comedienne. God knows I've forgotten her name. Can someone remind me? happy married life , senator. And your point being what exactly? Yaaaaaay see my people. May God bless your union guys. Luv u loads! Senator was my school mate back in d days @ Government College Umuahia.HML bro, may we continue to shine as one.